are not easy to understand. Damages, however, do exist which are not explainable - definitely not by the JAIC sequence-of-events - unless one is prepared to accept the only other alternative by which the same or similar movements and damages would have been created, namely the collision with another vessel. This would explain at least the very severe damage at the starboard side of the visor, created by an abrupt upwards movement and subsequent falling back of the visor and all the damages resulting there from. Time and again respective assumptions and allegations have come up in the course of the investigation either by survivor statements, e.g. observing a submarine conning tower near the heavily heeled ferry, or by external sources, but nothing concrete could so far be established, because information concerning submarines are classified. The public has been fed a lot of disinformation 1994-2001 that the visor of the 'Estonia' was totally incorrectly designed and manufactured and that the shipyards and naval architects of the world had little knowledge about ship visor design in 1980. The reason was to enable the Commission to blame the accident on the visor and indirectly on incompetent engineers and class societies, which were not given a chance to defend themselves. The Commission never explained in detail, what was really wrong with the visor design and, if anybody asked for clarifications, the Commission ignored to reply. Collision as cause of visor damages were never investigated. It was a clever tactic - accuse shipyards, class societies and engineers and then disregard any attempts on their parts to defend themselves. The Commission states in the Final Report (5) that the visor locks had too weak dimensions or scantlings. But for what? The locks had been designed for the vessel's original trade - protected coastal trading between Mariehamn and Stockholm and it had worked fine for 13 years. No damages were ever noted. Then the ship changed trade and started sailing on the open Baltic. Were the locks designed for that? Without any evidence the Commission suggests that. The Germans group of experts 3.13 has found plenty of evidence that the visor outfit (locks, hinges, etc) immediately was damaged (deformed, excessively worn, etc.) in the new trade due to bad maintenance, but the Commission had to ignore that information to be able to support its suggestion that only the 'faulty design' of the visor 1979 had caused the accident 1994 due to 'wave loads'. The Commission could evidently not say that the ship was designed for the North Atlantic, as that was not the case, but it made up that the ship was designed for the Baltic, the North Sea, the English Channel, the Mediterranean, the Red Sea, etc. But it was not the case either. The ship visor was just designed for coastal trading between Sweden and Finland. But the Rules were also applicable to the North Sea and the Channel and the 'Estonia' visor was in fact designed according those rules. We know that the Commission immediately decided - or was told - that the visor had caused the accident. The reader should by now know that the visor or wave loads did not cause the accident - the visor was still attached to the ferry when it sank. But as the Commission decided to make up a false investigation report based on the visor, it is important in this Part 3 first to describe the visor and its design loads from the point of view of a shipbuilder, then to reveal the false declarations of the Commission how the alleged 'design faults' caused the accident and finally shortly describe the German findings that the condition (maintenance, wear and tear, etc.) of the visor was quite bad. The Final Report (5) contains a completely incorrect description of the matter. The visor of the 'Estonia' was a movable part of the superstructure between decks #2 and #4 protecting the ramp leading into the superstructure 2.5 meters above waterline. The visor was not part of the hull of the 'Estonia'. The visor was of very simple and basic recognised design - see figure 3.1 above and 3.2 below. The visor consisted only of steel plates and stiffeners supported by three tiers of horizontal girders and the upper deck and a bottom horizontal support girder and some vertical web frames. The total weight was about 55 tonnes. The visor when closed was held in place against the ship by three locks - two side (sido) locks in the superstructure and one bottom (botten) - Atlantic - lock on the main deck #2. The function of the locks was generally to transfer the vertical wave/buoyancy load acting upward on the visor to the deck and the superstructure. Without the three locks the visor would otherwise flip up around the deck hinges on deck #4 by the vertical wave/buoyancy load, when pitching into a wave submerging the visor. The locks were of basic design. Each lock consisted of a lug on the visor, which fitted between two bushes of a locking pin assembly on deck #2 and superstructure frame. The two bushes of the locking pin assembly were held in place by lugs welded on the deck or superstructure. A pin held by the bushes would lock the visor lug. The pins were hydraulically operated. When the pins were engaged, they activated limit switches, which in turn activated the green light on the control panel just aft of the ramp to the effect that the locking pins had been pushed into the locks and the visor was locked. Evidently the locks could not transmit sideways loads. Evidently the locks could not transmit sideways loads. The visor was therefore also held in place against sideways and longitudinal motion/forces by locating cones (horns) on the deck and the superstructure, which fitted into suitable pockets in the sides and at the bottom of the visor. Longitudinal loads on the visor would of course also be transmitted to the superstructure by the rubber seals and other vertical contact points between visor and superstructure. It has to be pointed out that there was no arrangement to drain the space between the visor and the ramp about 2.5 meters above the waterline, e.g. a scupper with a non-return valve. The only way to drain out water between a leaking visor and a weather tight ramp was too open the visor (or to open the ramp). The visor on the 'Estonia' was not a very clever solution how to load and discharge cars and trucks into the superstructure through the bow, but it should only be used in coastal trade and look nice. 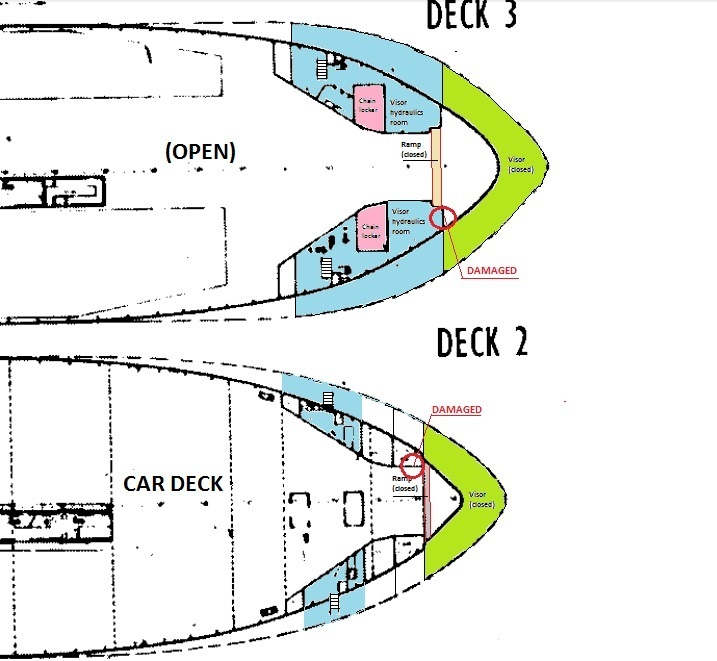 A simpler, safer and more economic solution would have been to fit the ramp straight on the bow (exactly as the stern ramps aft on all ro-ro ferries) and to fit a weather tight or watertight door on the inside in the superstructure with a proper drainage arrangement between ramp and door. It might not have looked so nice, but it would have worked much better and would have cost less. Many ships are built like that, e.g. military landing crafts but also ferries. "The outside part of the bow opening - the bow door - can either be arranged with two doors with the hinges at the sides and opening sideways, or as a visor with the hinges on the upper deck, opening upwards". It is of course not true and another evidence of the ignorance of the Commission, or its intention to mislead the public.